Cut Notes: 77 players at 4-over 148 from a field of 120 professionals. Weather: Thursday: Sunny and mild in the morning with temperatures in the lower 70s. Afternoon high reached 77 degrees with NNE winds 5-10 mph. Friday: Mostly sunny with a morning low of 58 degrees. Continued sun in the afternoon with a high of 77 degrees and NNE winds 10-15 mph. Saturday: Sunny skies with morning lows in the mid 50s. Mostly sunny in the afternoon with highs in the upper 70s and NNE winds 10-15. Sunday: Mostly sunny with a morning low of 58 degrees. Partly cloudy in the afternoon with a high of 84 degrees. Winds SSW 5-10 mph. DUBLIN, Ohio (AP) -- Two holes, two towering shots, two clutch birdies. Just like that, Tiger Woods broke out of a four-way tie and won the Memorial Tournament on Sunday with a 7-under 65 to cap off a high-charged comeback. And just as suddenly, he silenced the skeptics who wondered if he was ready to defend his title in the U.S. Open in two weeks at Bethpage Black. "I knew I could do this," Woods said after birdies on the final two holes gave him a one-shot victory. "I was close to winning, but the game wasn't quite there when I really needed it on Sunday. I rectified that." First came a 9-iron at No. 17 that Woods launched as high as he could, allowing the ball to land softly on the top shelf of a rock-hard green for a 9-foot birdie putt. More brilliance followed on the 18th, when Woods hit a 7-iron from 183 yards that stopped a foot from the hole, wrapping up his fourth title at Muirfield Village and moving him to fourth in the FedExCup standings. Then came a bold observation by tournament host Jack Nicklaus. He had said earlier in the week that Woods, with 14 career majors, would probably break his record of 18 majors in a couple of years. "I suspect No. 15 will come for Tiger Woods in about two weeks," Nicklaus said at the trophy presentation. "If he drives the ball this way, and plays this way, I'm sure it will. And if not, it will surprise me greatly." There were no surprises Sunday for Woods, the best sign of all. He hit the ball where he was aiming and found every fairway in the final round, the first time he had done that on the PGA TOUR in more than five years. He missed only five fairways all week, his best performance off the tee since the 1998 Masters. 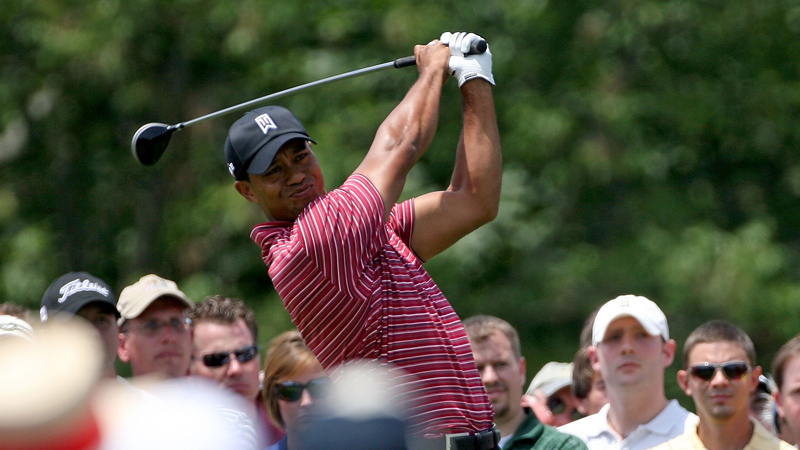 "It was nice to play this well going into the U.S. Open," Woods said. "This is how you have to hit it in order to win U.S. Opens." He managed to work in some of Muirfield Village magic along the way, surging into contention by chipping in for eagle from a nasty lie in thick rough behind the 11th green. "I don't even know how to describe it," said Michael Letzig, who played with Woods. "It was the best golf I'd ever seen." Jim Furyk, part of the four-way tie on the back nine, made a 20-foot birdie putt on the final hole that gave him a 69 and allowed him to finish alone in second. Furyk is close friends with Woods, and had been hearing the speculation that Woods was not the same. "I just wish you all would just quit (ticking) him off ... so he has to come back and keep proving stuff," Furyk said. "I think he answered a lot of questions today." Woods finished at 12-under 276 and won for the 67th time in his career. The timing could not have been better. He was within one shot of the lead going in to the back nine at the Quail Hollow Championship and made nothing better than par for a 72. He played in the final group at THE PLAYERS Championship, couldn't find a fairway and closed with a 73. On a firm, fast course under steamy sunshine at Muirfield Village, he was close to perfect. "It wasn't just the last two holes, it was all week," Woods said. "I felt comfortable hitting it left-to-right, right-to-left. Didn't have a problem taking the ball up in the air or bringing it down. That's what I was looking for. That's what I was able to do at home in my practice sessions, and now it's just a matter of carrying it out here onto a tournament venue and doing it." After a bogey from the bunker on the 16th, Woods was tied with Furyk, Jonathan Byrd and Davis Love III. His two final birdies gave him a cushion, and no one could catch him. Byrd had the best chance to catch Woods. Two shots behind, he hit his approach to 4 feet on the 17th, but missed the birdie putt. Byrd finished with a meaningless double bogey for a 72 and tied for third with Mark Wilson (73). Love, who could have avoided a 36-hole U.S. Open qualifying Monday with a victory, got into contention with consecutive birdie putts of about 50 feet, only to miss an 8-foot birdie try on the 15th hole. He fell out of the hunt with a bogey from the fairway bunker on the 17th, then hit his tee shot into the water on the 18th hole and closed with a triple bogey. Matt Bettencourt, the PGA TOUR rookie who started the final round tied with Wilson, held his own for seven holes until a three-putt bogey, followed by a chunked wedge into the water for a double bogey. He closed with a 75 and tied for fifth. Letzig had never experienced such an environment as playing with Woods in the final round. "I've never seen anyone hit irons like that," Letzig said. "I tried not to watch him, but some of those shots were unreal." Woods' driving set up those iron shots. The fairways at Muirfield Village are among the most generous, but he wasn't close to missing them and often set himself up on the right side to attack the pins. "I don't know why everyone talks about how bad he drives it," Letzig said. "Every drive I saw was perfect."